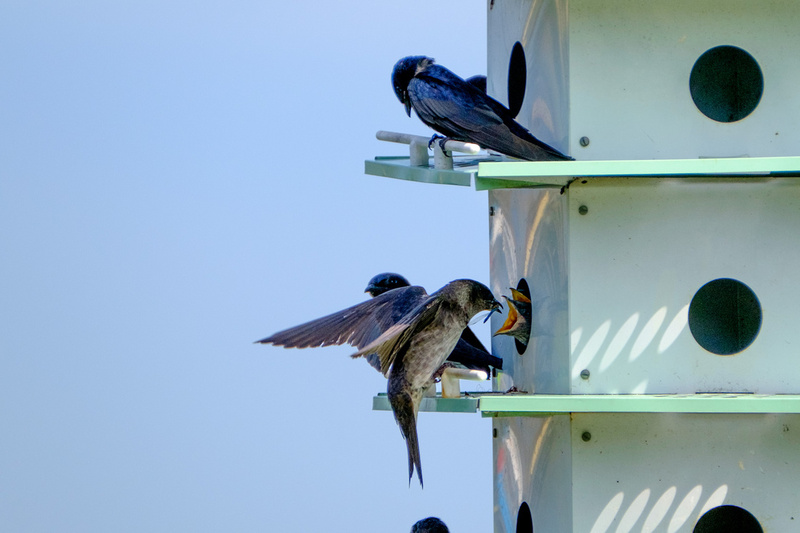 Thanks to the diligent work of GNAS president, Steve Betchkal, we annually catalog Purple Martin colonies across our 17 county area. Through active plotting and record-keeping, we hope to keep careful tabs on how Martins in our region are doing, and perhaps serve as a resource for those who might want to attract these birds to their own property. Winged Wonders (Live Birds) – Raptor Education Group, Inc.
Don’t let the winter weather keep you from getting outside! Anne Geraghty (and several other local birding experts) will lead two field trips in search of golden eagles in Buffalo County and snowy owls in Dunn County. On Saturday Jan 28, we’ll meet in Alma then head up into the bluff country in search of golden eagles. Trip runs 11:30-2:30. On Sunday Jan 29, we’ll meet in Menomonie and scour the nearby countryside for snowy owls. Trip runs 3:00-5:00. In each case, we’ll have local experts helping us track down birds they’ve seen in the area. While there’s no guarantee, we’re very optimistic about finding our target birds. We may also encounter other winter specialties such as rough-legged hawks, northern shrikes, or snow buntings. At a very minimum, it will be an informative afternoon spent with other area birders! Gaylord Nelson Audubon is holding its Annual Summit on Saturday, February 11th, 2017, from 1:30-4 PM at the Menomonie Market Food Coop (2nd Floor), at the corner of 9th and Main Street in Menomonie. We will be discussing plans and projects for 2017 and beyond. The public (and not just Audubon members) is invited to attend. This is a great opportunity to meet other nature lovers and conservationists. Also, if you would like to get involved with Gaylord Nelson Audubon Society, this meeting will be your opportunity! We will be electing officers and we welcome nominations for enthusiastic members to serve as secretary and treasurer. Please consider taking on a role with GNAS and contributing to local conservation efforts. There’s a lot in store for 2017 and you can find out what Gaylord Nelson Audubon Society has planned in our annual newsletter. 2017 Bird School is happening! Gaylord Nelson Audubon Society is teaming up with Beaver Creek Reserve to offer an expanded and enhanced version of “Bird School” in 2017. The class will offer beginning birders a whirlwind introduction to all things avian including bird identification, behavior, songs and calls, anatomy, migration, and conservation. Held at the Beaver Creek Reserve facilities, we’ll have a great line up of speakers and field trip leaders; and this year we’re including a morning session devoted to bird banding to offer students a chance to see living birds up close. Registration will be open in January. Before then, you can sign up now to be notified when registration is open. Don’t miss out! Posted in No Content	| Comments Off on 2017 Bird School is happening! Gaylord Nelson Audubon Society is pleased to announce the annual Christmas Bird Count. There are eleven Christmas Bird Counts (CBC) that are annually held within the GNAS territory. Christmas Bird Counts are a national tradition where an attempt is made to find, identify and count every bird within a 15 mile diameter circle in one day. Anyone can participate in a Christmas Bird Count. Novice birders will be assigned to a team to spend a morning, afternoon or all day counting birds. Each team will have an experienced birder as they search their assigned territory within the count circle. You can even participate by counting birds at your feeder if you are within one of the CBC circles. You can sign up by going to www.christmasbirdcount.org or directly contacting the compiler for the count within which you wish to participate. For more information contact Robin Maercklein at 715-501-0527 or robinmaercklein@nullgmail.com or one of the folks listed below for the count in your area. Are you interested in putting a name to that bird song or that flash of color in the trees? Join the Indianhead Chapter of the Ice Age Trail Alliance and Gaylord Nelson Audubon Society for a spring birding hike on the trail on May 15. This year’s spring hike will be held from 7-9 a.m. It will leave from the Lundberg pole barn at 2918 140th Street, or about three-quarters of a mile south of County W, or about one-half mile south of the trail parking lot. Look for the yellow Ice Age Trail event signs. Field biologist Naturalist Robin Maercklein will lead our easy-paced look at birds of our area. A lifelong birder and biologist, Robin has been studying birds in Wisconsin since 1968. He has conducted bird surveys for University of Minnesota, U.S. Fish & Wildlife Service, Wisconsin DNR and others, including over 20 years with the National Park Service. He currently serves as Polk County Coordinator for Wisconsin Breeding Bird Atlas and is an eBird reviewer for five northwest Wisconsin counties. Cornell Laboratory of Ornithology’s eBird is the world’s largest wildlife database. The Lundberg property is awaiting final state approval for acquisition by the DNR. The 250-plus acre property includes headwaters of the Trade River and adjoins Straight Lake State Park. Bring water, comfortable hiking boots or shoes, insect repellent and an appetite to learn about the bird life of Polk County. Questions? Call Brook Waalen at 715-566-3061.